Dress Up Your Desk This School Season – PopTalk! With summer’s fun-filled days flying by, it’s almost time to gear up for the school season. While the thought of heading back to days spent indoors can be dreadful to most, why not spruce up your study space for a stylish and organized area that you can look forward to spending time in? Whether you’re a student or a teacher getting ready for the upcoming school year or even a professional in need of an office update, make the most of your work space with these six easy and colorful additions suggested by Paula Berberian, Creative Director of WallPops, the premier line of peel-and-stick wall art from Brewster Home Fashions. With long days ahead filled with much to do, bring the outdoors in with these file folders from Paper Source. 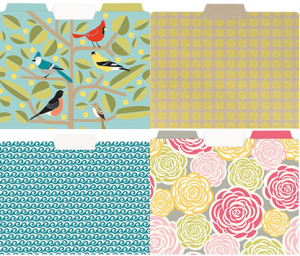 The Bird, Sunshine, Waves and Roses sets (clockwise from top left) makeover traditional file folders into easy desk décor that is so stunning, you’ll nearly be able to smell the beach or roses. Folders are one- and three-tabbed and approximately $7 for a set of six. Stay on top of all of your upcoming deadlines and activities by keeping a wall calendar in an easy-to-view place near your work space. Save paper and get happy with the new, lively WallPops by Jonathan Adler peel-and-stick Dry Erase Monthly or Four-Piece Calendars. Monthly calendars are available in Links, featuring white and green circular tie-knots over a teal background and navy border (at top left) and Honeycomb (top right) with a classic navy and white honeycomb pattern and teal outline. Also worth trying is the new Diamond Message Board with a white dry erase board framed with a teal and navy, diamond-patterned border (bottom left). Stay ahead of the game and plan four months in advance with the Bargello Wave Four-Piece Dry Erase Calendar set (bottom middle). The calendars feature Adler’s signature groovy waves in blue, orange, green and pink with one wave color per calendar. To create an overall look, opt for the coordinating wave Dry Erase Board (bottom right) in a rainbow of colors with an orange outline that is sold separately. Message Boards and Monthly Calendars are 13 by 17.75-inches and approximately $17.99 per pack. 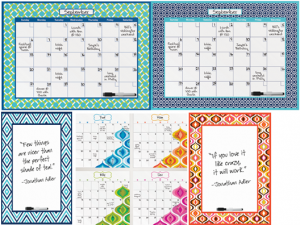 Four-Piece Dry Erase Calendar sets are 13 by 13-inches and are approximately $20.99 per pack. Don’t overlook the tools you use every day, whether it’s a tape dispenser, scissors or a stapler, update life’s daily necessities and make each day that much more special. With this in mind, add some serious design with this ANYTHING stapler, winner of the 2009 “Best of the Best” Red Dot Award, an internationally recognized quality seal for exceptional design. 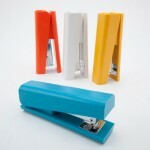 The sleek-lined stapler is available in orange, yellow, turquoise and white. Available at www.shophorne.com for approximately $40 each. Store all your desk essentials tastefully with these hand-painted metal desk caddies and trays. 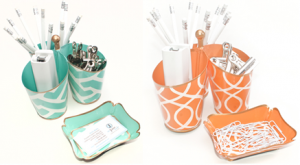 Caddies offer three connected compartments for holding writing utensils or tools along with a tray where business cards, paper clips or rubber bands can be collected. Caddies are approximately $30 each and trays, sold separately, are approximately $20 each. Both are available at www.seejanework.com. Brace Yourself For A Busy Fall! Beyond the Wall – Other Ideas for WallPops!